You can strip a Chambers Range of ALL WHITE PORCELAIN OUTSIDE PANELS. except the oven door. and cook just as well as with all panels in place. "Why is this important?" you ask. It's impossible to insulate heavily enough to cook efficiently with the gas turned off, and use the outside panels as retaining walls for the rock wool. CHAMBERS RANGE INSULATION IS HAND-PACKED TO CAPACITY in separate Oven and Thermowell hulls. If little Willie ever runs his villocipede into your Chambers Range, thereby cracking the porcelain finish-or if the enamel is chipped by movers or anyone else - the outside panels can be changed without affecting the insulation in any way. Furthermore, you can check heat distribution in a Chambers Oven today, and recheck it in ten years, and find the distribu­tion to be practically identical. Only when insulation is packed as tightly as it is in Chambers Ovens and Thermowells can you be assured that heat distribution will not shift and change through the years. Any less insulation can settle and shift, and eventually change oven baking results. 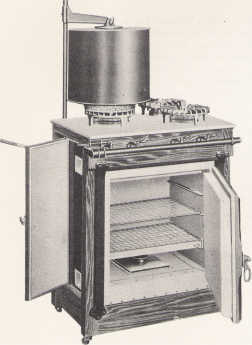 Pictures show front and back views of this unique Chambers structure-with cooking units built up separately and assembled in a welded steel frame. Thermowell and broiler are fastened into the extra-heavy cooking top .
. 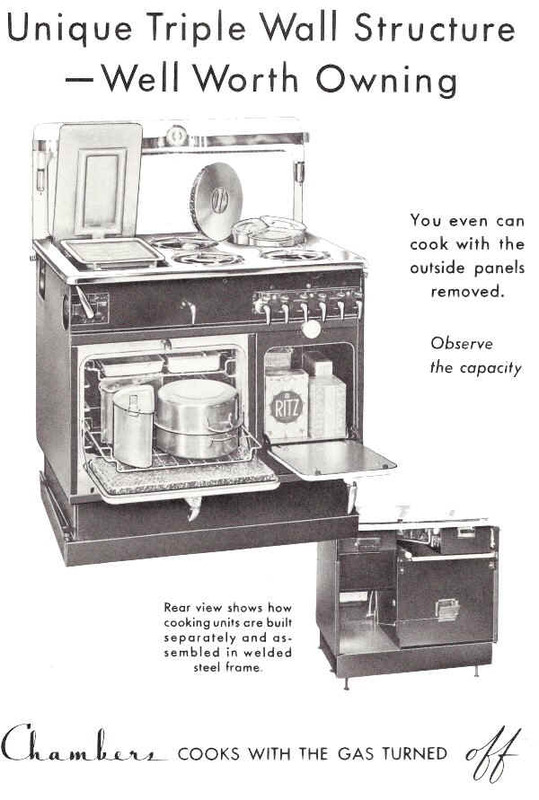 NOTE CAPACITY OF OVEN. And see how convenient is the storage cabinet.